Choose Order | Place Order. A dialog box appears. Click Send to place your order. Check that you receive an acknowledgment e-mail message within one business day. The confirmation insures that eMachineShop received the order and that you can receive email for any questions that may arise. Your parts will be manufactured and shipped to you. In case of difficulty, see Order Troubleshooting. Like having an experienced machinist sitting next to you, the Analyzer is a software expert system that gives you instant manufacturing advice, warnings and errors. You should run the analyzer periodically during your design process and before ordering. Select a price/time option and click OK. Note that changing your price/time selection may change the analyzer results. Review the warnings and errors in the right sidebar. Some errors and warnings can be clicked on so that the corresponding portion of your design will be highlighted. Resolve all errors and as many warnings as you can. 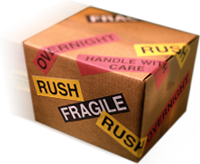 The more warnings you resolve, the more likely your job will be accepted, run smoothly and ship on-time. If you can’t resolve some warnings you can still place your order. Before placing an order you must enter your shipping address and payment method. Click Save Default so you can later retrieve your address info using Load Default. order and mail your check to the address shown in the dialog. You can check the price of your part at any time. For example you might want to check the price before and after adding a new design element. Choose Job | Price / Analyze. If there are no errors in your design, the price dialog will display a list of several price/time options. You might also see some greyed suggestions for how to change your specifications to reduce cost or time. Low and high HD numbers indicate respectively a small and large change from your original specifications. Select the price/time combination you prefer. To learn how pricing is done for Comments To Machinist see in the CAD Line | Machine | Comments to Machinist. You can determine the cost of a particular feature. For example, you might want to know the extra cost to round the edges of your part. Make note of the current price computed by the CAD. Choose Job | Price Analyze. Subtract the listed price from the prior noted price to determine the cost of the feature. The complex software quotation mechanism is continually being modified to reflect real costs more accurately. Minor changes you make in your design or any of the many settings and options will effect price. Costs of material, labor, shipping, etc. vary over time. New machines are frequently added which can influence cost. The automated pricing is valid the vast majority of the time, however there are situations where you will be notified of a price change and your approval requested. For example parts with low structural integrity; difficult workholding; unusual thread specs and high geometric complexity. The price file is internal information used to calculate the price of your job, typically changed every few days and downloaded automatically. You can also download the price file manually. Choose Edit | Preferences | Pricing | Update Now. If the above does not work (due to a firewall etc) see here. Because the eMachineShop CAD is intimately tied to manufacturing processes, the way you design your part can effect the price – especially for 3D parts. To optimize your design for the lowest price you can try multiple designs and use the one with the lowest price. For more detailed tips see Reducing Cost and Time. The automatic pricing system is not perfect. If you feel that a price generated by the system is wrong, request a manual quotation as follows. Add a Comment to Machinist in Top View stating “For quotation only – do not proceed without my approval.” and then place your order using the pay-by-check option and check #0000. Your submission will not be processed as an order unless we receive your approval. You can place a standard order or change an order in progress. You can change an order in progress. For example you might want to change a powder coat color. Choose Job | Settings | Order Options | Standard order. Choose Order | Place Order and proceed as indicated. Open the original order file. Choose Job | Settings | Order Options | Change order in progress and specify the original order number. The machine IDs string should look like “534, 559, F254-92”. These numbers can be found in your order confirmation email – for example: “Machines: 534. Mill 3-Axis, 559. Tapping, F254-92. Finish, F260-2. Finish”. Read the notes about additional charges. After your changed order is received your old order is canceled and you will get a confirmation message that your change order has been received, along with the new order number which you should refer to subsequently. You can include multiple different parts in one drawing file (one order) for 2D designs if the thickness of each part is the same. For example, you could design a sheet metal box consisting of three separate 1/8″ thick pieces in one drawing file (one order). To include multiple designs simply include each part in the drawing on the same screen. If you receive an error about multiple parts it is usually because your parts do not conform to the 2D part definition. You can also have differing quantities. For example, you could order 10 of one part and 20 of another. To order 10 of one part and 20 of another include one copy of the first part, two of the second and then order 10 sets. 3D designs permit only one design per drawing file (one per order). Files that split a single 3D design in two using the Air Inside feature are not accepted. Get the eMachineShop CAD file from the person who designed the part – the file will have a .ems extension. Download and run the eMachineShop CAD software. Choose File | Open and open the design file. Choose Order | Place Order and follow the instructions. Payment method (credit card or prepay by check). If paying by credit card, provide your credit card information. Note: eMachineShop will not be responsible for any errors that result from your not directly reviewing your order via the CAD software. The number of parts shipped to you may differ slightly from the quantity ordered, the range being indicated just below the quantity in the Job | Price dialog. For example if you enter quantity 100 you might see “+/- 5”. This means you will receive between 95 and 105 parts. If you must have no less than 100 you should select a high enough quantity that the minimum value is 100. Although 2D parts allow for multiple parts on one screen, when ordering a quantity of parts it is usually more economical to draw the part only once on the screen and to use the Quantity setting in the price dialog to select the desired quantity. In other words, if you need 10 of a part, draw the part once and set the quantity to 10 instead of drawing the part 10 times and setting the quantity to 1. However if you need, for example, 100 of one part and 200 of another you can draw one copy of the first part and two copies of the second and order 100 sets. 2D jobs must not have more than 25 parts on the screen and must not take more than 10 minutes of CPU time to price. It is often useful to have a sample before a full run especially for a new design. In fact, it is common even for experienced engineers to modify a prototype multiple times before getting it right. If you need a sample before a full run, simply begin with a small order. For example, if you plan to run quantity 100 but want to run 2 pieces first to check your design, begin by placing an order for 2 and after you verify your design, place an order for 98. (eMachineShop does not offer to run a few parts for customer approval before continuing with a full run because doing so requires two machine setups which are not included in the computed price.) The best thing to do to minimize the need for samples is to design carefully and have someone else check your design. You can get the status of your order at any time. Choose menu Order | Request Order Status. On the launched web page supply the requested information. Your order status will be emailed to you. Lines: Press TAB (and SHIFT+TAB) to step thru each line in your drawing. Check the position, numeric bar settings, and the information on the status bar. Zoom In: Use a magnified view to review intricate areas of your design. 2D Views: Look at all relevant views in the View menu. 3D View: See your design from all angles. Bends: Use Job | Model Bends to analyze parts with bends. Comments: Review any Comments To Machinist text & lines. Job Menu: Select each command in the Job menu and review all information. Completeness: Check for missing holes, cutouts, features, etc. Specifications: Make sure you communicated every important tolerance and specification completely. Variation: Reordered parts may vary from prior order(s). Use tolerances to specify allowable ranges. Standard Finish: Parts may be vibratory tumbled – specify otherwise if needed. Surface Finish: Consider adding a finish, such as powder coating, to protect surfaces and improve appearance. Tolerance: Make sure your design has proper allowance for tolerance variation. Tolerance Limits: See eMachineShop’s general tolerance limits. Fit: Ensure that your parts fit together properly. Analyzer: Carefully read and resolve as many advisory messages as possible. Changes: If you modify your design, repeat the above steps before ordering. eMachineShop offers a few special shipping modes. When placing multiple orders you can reduce shipping costs by requesting shipment consolidation, typically into one box. Orders to be consolidated must be placed on the same day. To request consolidation, in the Pricing dialog check the consolidation option. The reduced shipping cost will be shown on the invoice you will receive with your shipment. Individual orders within a consolidated group will be charged to your credit card as they are manufactured. Your consolidated order shipment will usually occur when manufacturing of all the orders is complete, however eMachineShop reserves the right to ship prior to completion of all orders when deemed appropriate. You can drop ship eMachineShop orders. For example, if you are in the ice cream equipment business and want to sell to your clients ice cream mixer components you designed, you can order the mixer parts from eMachineShop and have the parts dropped shipped directly to your clients. In Job | Settings | Address enter your name, email and phone plus your clients business name and address. In Job | Settings | Payment select credit card and enter your address. In Job | Settings | General | Administrative comments you can enter special instructions such as “Include ABC Ice Cream business card and brochure. Omit invoice”. eMachineShop will charge your credit card and you will bill your client. You can reorder parts that you ordered previously. For example, after ordering a prototype quantity you might want to order a production quantity. Use File | Open to open the original file. Choose Job | Settings | General | Reuse Tooling and enter the requested information if applicable. Choose Job | Price/Analyze to check current pricing and check for any warnings or errors*. Choose Order | Place Order. * An order that passed the analyzer in a prior version of the software may not pass the analyzer in the current version because the expert knowledge system is continually being improved. It may not seem like an improvement when an order that went thru previously does not go thru on a reorder, but usually a small change in the design can resolve any new warnings or errors. For help adapting a reorder to pass the analyzer you can also contact tech support. Select the closest matching material. Estimate how much material is needed accounting for work-holding area and some rejects. In the Special Material dialog enter instructions. Place your order and wait for a manual price quotation. If you agree to the price, ship material to the address on the bottom of the contact page. Show the job number on the outside of the box. We now offer Quick Turn orders for faster delivery. Quick turn price/time options are listed in the Price dialog. Quick turn orders are subject to acceptance review. Our guarantee: if a Quick Turn does not arrive on time just let us know and we will give you a credit for the difference in price from the closest standard pricing. Quick Turn orders are subject to the following requirements.